I think you know by now that I will try to stuff challah with almost anything: meatballs, pesto, pastrami and even candy bars. So it just seemed silly that I had yet to try and stuff some challah with an entire wheel of cheese. It was time to tackle this unchartered territory. 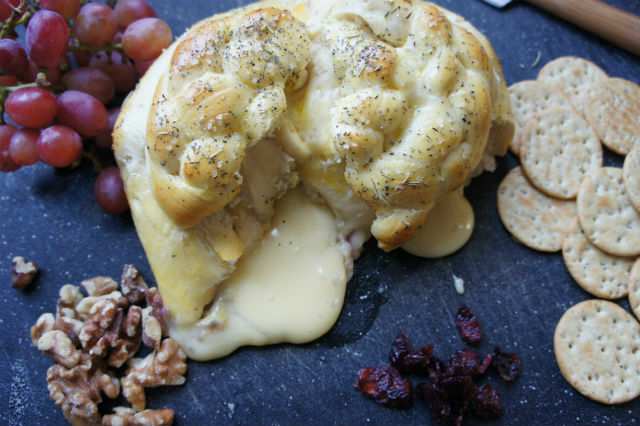 But I guess it should come as no shock: challah wrapped around some brie is delicious, decadent and a great party appetizer, whether it’s for New Year’s Eve, an evening with friends and a case of wine or Shavuot. Here are a few tips for executing this recipe. Leave the brie in the fridge until the very last moment before ready to bake. Don’t worry that the brie will get too gooey – some will likely leak out, and that’s just part of the messy delicious fun. Experiment with different jams or chutneys for fun flavor combinations. Because it was fall and I had leftover cranberry sauce, that’s what I used. But you could also use a spicy pepper jelly, a mango chutney, raspberry jam, apple butter or fig jam. You can really use any plain challah recipe you like for this. My recipe should be split into two and can be made into two baked bries for a large party, or you can make one baked brie and one regular challah. Add another 1 ½- 2 cups of flour, mixing thoroughly and then remove from bowl and place on a floured surface. Knead remaining ½ cup flour into dough, continuing to knead for around 5 minutes (or however long your hands will last). Preheat oven to 350 degrees. Split dough evenly into two pieces. Make a ball with the first half of challah and then roll out into an even circle of dough using a rolling pin and your hands. Place the wheel of brie (rind still on) in the middle of the challah. 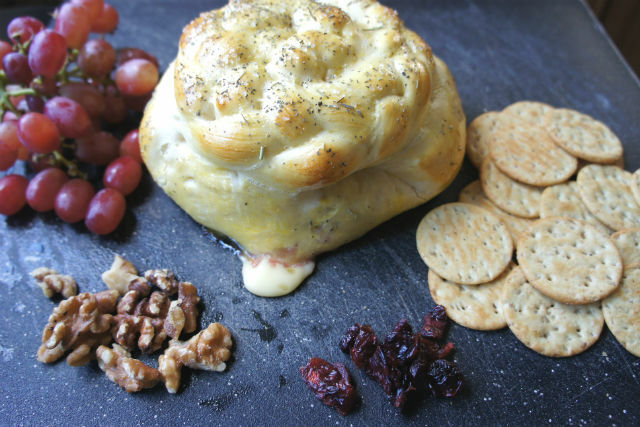 Top brie with cranberry sauce, chutney or jam if desires. Fold up ends to cover cheese and pinch. * You can make a small braid with extra dough and place on top if you want to get fancy. In a small bowl beat 1 egg for egg wash. Brush on top of challah. Sprinkle with thick sea salt and dried rosemary if desired. Repeat with other half of dough or bake into a regular shaped challah. Bake for 25 minutes, or until golden on top and cheese is starting to ooze out. Serve with grapes, dried fruit or crackers while brie and challah are still warm.